For Spring/Summer 2019, we once again encounter sneakers, with or without laces, slip-ons and the ubiquitous ballerinas, to be worn for special occasions. 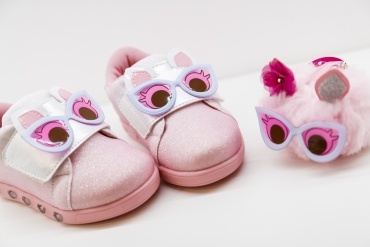 Many of the product ranges are inspired by the latest women’s trends, but re-interpreted for little girls, to guarantee comfort, quality and style. Pastel colours dominate and also shiny gold and silver. Glamorous, romantic details prevail in high-soled sneakers and all-white shoes with diamante and glitter inserts in pink, mauve, pale blue and cream – pastel shades and shiny finishes with two-toned reflexes. Styles for children take a comfortable approach with ideas inspired by the animal kingdom, revisited with a fun, playful touch, which, in the case of little girls, is also combined with coordinating accessories, such as bags and rucksacks. For little boys, we see micro prints, nautical stripes or sporty styles in electric blue, turquoise or green. Plenty of little sandals abound in open styles with beads, fringes, interweaving and multi-colour textures, but they are not excessive. There are numerous designs with rope soles and embroidered uppers, from lace-ups to mini espadrilles.